After years of not crocheting at all, I suddenly got the urge last winter to make a circle scarf for one of my young friends. Armed with a large crochet hook so I could work loosely for more softness, I used a stitch I remembered from making a throw. Any questions, look at the throw. Months later, my daughter-in-law Heather planned to teach in Europe for part of the summer. I crocheted a lightweight circle scarf for her, using a soft bamboo yarn in one of her favorite colors. Meanwhile, my 18-year-old niece had been accepted to summer ballet school in Seattle: she would need a similar scarf for those cool evenings. In a fuzzy ballet pink? Done. At the Intergalactic Quiltapalooza in November, I bought some hand-dyed mohair yarn. My niece, now in the Pacific Northwest Ballet’s Professional Development Program, was living in Seattle and rehearsing for The Nutcracker. I wanted to use the mohair to make her a warmer scarf for winter. This time I branched out with a new pattern (yay for free downloads!) The pattern was narrow — maybe too narrow, but an even bigger crochet hook made it work up just right. I created rows of poufy shell stitches until the yarn threatened to give out, then added looped fringe to the ends. Fun! And not only did she love it, but she got compliments galore. This only added fuel to the fire. Let’s see… what other females are in my life?? My son Greg’s lovely girlfriend (beige tweed-look yarn)! And my 8-year-old niece (colorful stripes alternating with white)! Waaaait a minute…. I still don’t have a scarf! Back to the hobby shop. 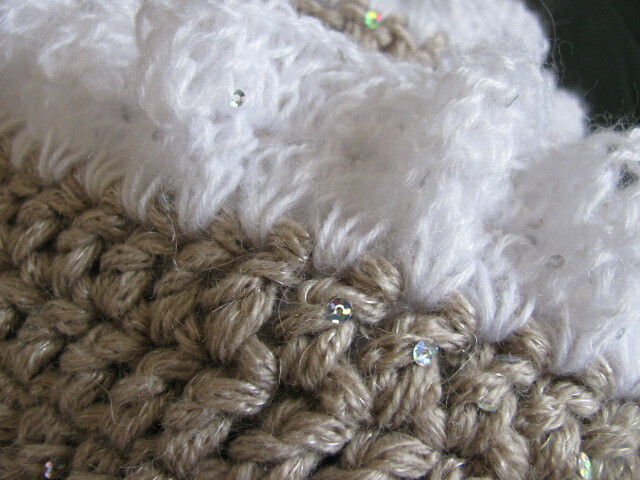 Heady with success, I bought a very chunky taupe yarn with sequins, and a hook as thick as my pinky finger. No idea what I would do with it, but the color would be beautiful with my new short coat. I imagined ruffles or something. Well, the first couple of attempts had to be pulled out. Apparently “drapey ruffles” and “chunky yarn” are incompatible. So I made a long, skinny scarf and then looked for an extra-fine yarn for the ruffle. I found the perfect yarn — it even had sequins like the chunky stuff — but not in the right color. I decided to go with white, and finished the last stitch while visiting family after Christmas. Okay, I must first emphasize that the scarf looks very pretty when you just hold it or drape it over the sofa or whatever. But the other day I realized that I had not actually worn it yet. (Temps have been in the 60s and 70s; what can I say?) So I wrapped it around my neck and looked in the mirror. The scarf looked like a chunky taupe turtleneck topped by a white Elizabethan ruff. I yanked it off. When Brent came home from work, I told him about trying it on. “It made me look like Sir Francis Drake,” I complained. Well, the good news is that you can wear the scarf in different ways to avoid the Elizabethan-ruff effect. The bad news is that while the taupe looks great with my jacket, the white does not. So, I have a sparkly experimental scarf that I think will be looking for a home. 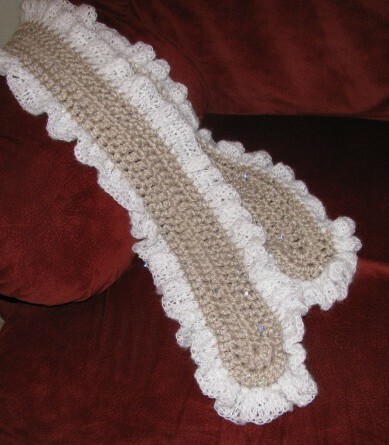 Soli Deo Gloria sisters, anybody need a warm taupe-and-white scarf?? This entry was posted in I Remember When... (my OWN stories) and tagged crochet, disaster, experiment, gifts, handwork, humor, needlework, scarf. Bookmark the permalink. Me, me, me! I love scarves!!!! Or, maybe we can make it a giveaway at the RETREAT?? BTW, Brent’s comment totally made me laugh out loud! I’ve had friends who’ve taken up knitting and crocheting recently. They just love it, too!! My mother knits. I tried it in high school. I’ve yet to try again. But I can relate to really getting into a new thing that spurs my creativity! Hi, Kathleen! I still have flashbacks to my one dismal attempt at knitting. I hadn’t thought about it, but you’re right… learning the basics of crochet has spurred my creativity. Now I feel comfortable trying experiments like the ruffled scarf, which I totally made up as I went along. Thanks for commenting! As I was reading, I was thinking of asking how I could get a scarf! I love scarves!! But I sure don’t want anything that leaves me with the possibility of being be-headed!! 🙂 But it’s very pretty! My grandmother taught me to knit and crochet when I was a kid. We started off making slippers. Actually…..everything else I tried to make also looked like slippers!